Front Binding – Today brings another Heritage exclusive to the blog, R.D. 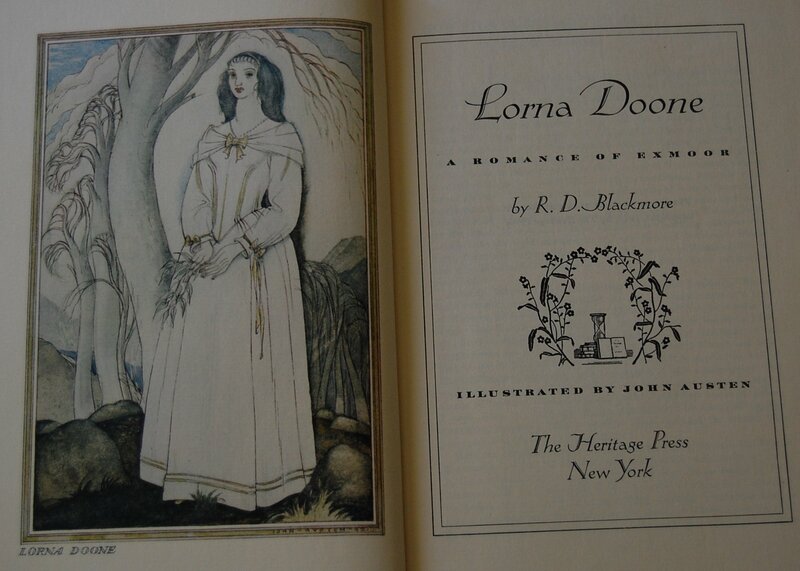 Blackmore’s Lorna Doone. A Victorian novel written among many other greats of the era, the book is perhaps considered a minor classic in contrast to its more famous contemporaries like Great Expectations and Silas Marner, but it remains a romance icon regardless. The Limited Editions Club however passed over printing an edition of their own, but we do have this Heritage exclusive to consider. Blackmore did not get a second publication. 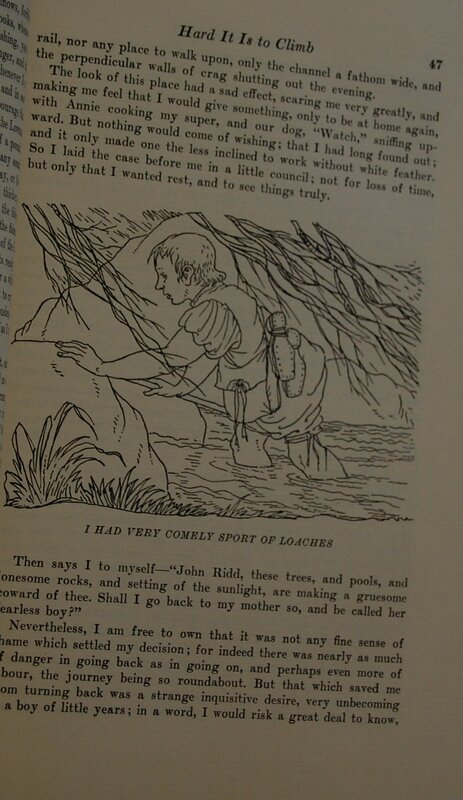 The book’s illustrator is a different story, as John Austen was called upon for his third Heritage exclusive, following David Copperfield and The Vicar of Wakefield. 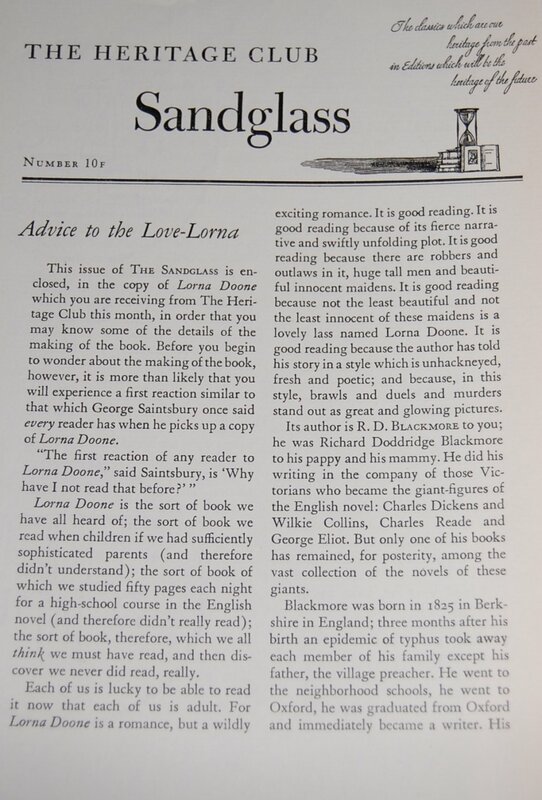 We’ve seen a fair amount of Austen’s work thus far on this blog, as we have discussed Vanity Fair, The Faerie Queene and the aforementioned Vicar, where I go into his publication history. This is very much in Austen’s usual standards of illustration, with hauntingly beautiful full-page color prints and several line drawings decorating the chapters, and as such may or may not please your eyes, depending on your feelings of Austen’s style. I for one feel this novel fits Austen’s artistic proclivities. Design Notes – The designer is unstated, so it’s conceivable George Macy handled it, as is often the case when such commentary is lacking in a Sandglass. I’ll update this when I find out for sure. The color prints were reproduced by the Photogravure and Color Company of New York, while text setting and printing was done by Rochester’s The Printing House of Leo Hart. The font is Scotch. Paper was supplied by The West Virginia Pulp and Paper Company, while Russell-Rutter did their usual binding services. 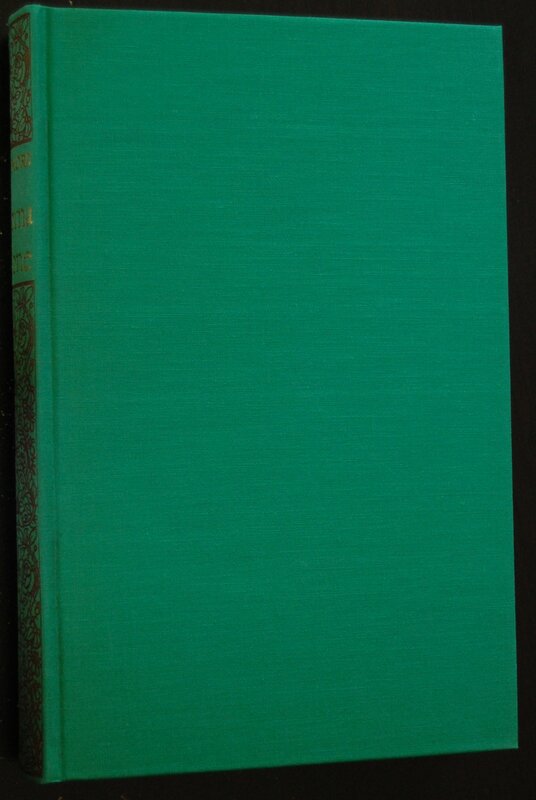 Spine – The front and back covers are pretty barren save the green cloth, but the spine has this delightfully intricate design. Title Page – Interestingly we get a rather large reproduction of the Heritage logo in the center of this title page (minus the HP). While uncredited here, John T. Winterich stepped in to discuss the book’s origins and history within a short Introduction. Page 47 – An example of Austen’s linework. 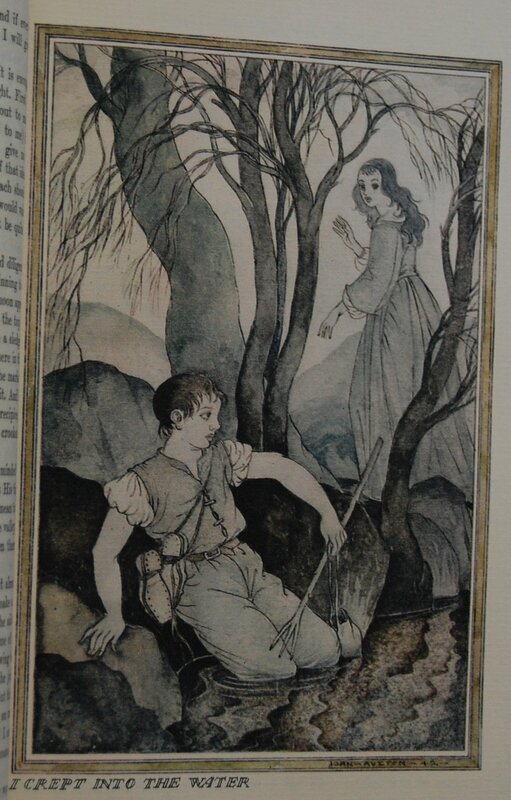 Page 56 – Haunting is a good word for Austen’s color plates in this book, with this possibly standing as my favorite piece of his. Personal Notes – I acquired this at Bookbuyers in Monterey last time I was there. The condition was exquisite! Bright and vibrant, unlike other copies I had seen before. Happy to have this in my collection. 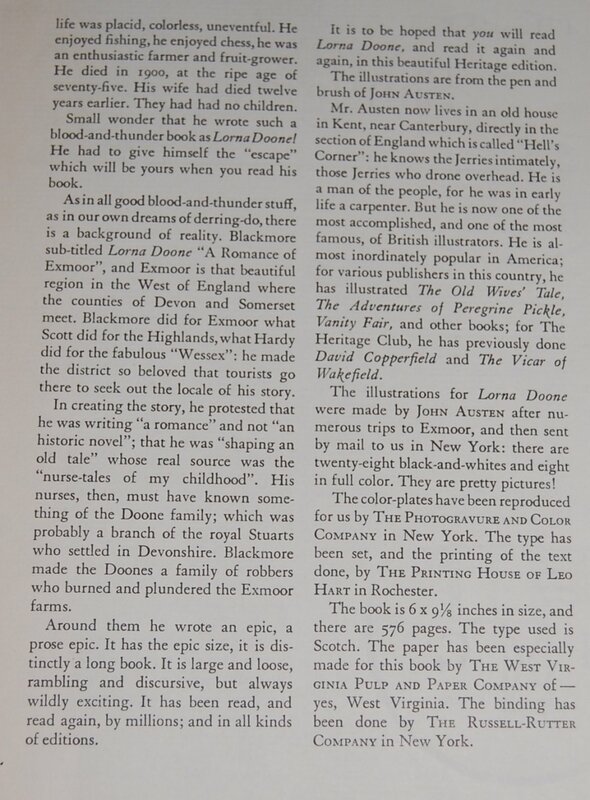 You are currently reading Heritage Press – Lorna Doone by R.D. Blackmore (1943) at The George Macy Imagery.